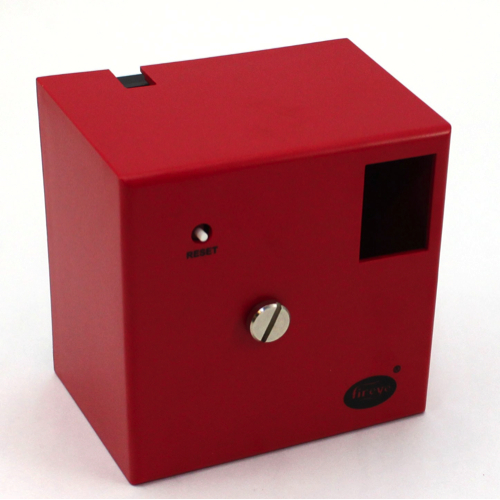 Fireye® Modular M-Series II Flame Safeguard Controls are compact, modular burner management systems. They are designed to provide automatic ignition and continuous flame monitoring for com- mercial sizes of heating and process burners that use gas and/or light oil fuels. Flame monitoring is accomplished by miniature UV scanners or Flame Rod detectors and plug-in amplifier and programmer modules which connect into a standard chassis and wiring base. Interchangeable programmer and amplifier modules allow for complete versatility in selection of control function, timing, and flame scanning means. Functions such as relight, two stage capability, nonrecycle air flow, purge timing, and pilot cutoff are determined by the programmer module. Type of flame scanner (UV or Flame Rod) and Flame Failure Response Time (F.F.R.T.) are determined by the amplifier module. Some programmer modules are equipped with a series of dipswitches to select Purge Timing, Pilot Trial For Ignition (P.T.F.I.) timing, and Recycle or Non-Recycle operation. LED indicator lights on all programmer modules indicate the operating status of the control. In the event of ignition failure, or following a safety shutdown, the unit locks out, activating an alarm circuit. Manual reset is required. Remote reset (via remote pushbutton or power interruption) is available on the MC120R, MC120P and MC230R chassis. A detailed description of the various programmer modules is found later in this document. Test jacks are provided to permit flame signal measurement during operation. A “run-check” switch is provided on the MP560, MP561 and MP562 programmer modules to assist in testing size, position, and stabilization of the pilot. Modular M-Series II controls incorporate a safety checking circuit that is operative on each start. If flame (real or simulated) is detected prior to a start or during the purge, the fuel valves will not be energized, and the unit will lock out. 120 VAC, 50/60 Hz Chassis. 120 VAC, 50/60 Hz Chassis. Meets European EN230, EN298 approval. 120 VAC, 50/60 Hz Chassis with remote reset and post purge. 120 VAC, 50/60 Hz Chassis with remote reset. Meets European EN230, EN298 approval. 230 VAC Chassis. Meets European EN230, EN298 approval. 230 VAC Chassis with remote reset. Meets European EN230, EN298 approval. Programmer, Relight function. For MC230, MC120E only. Programmer, Relight function. Will ignore flame signal during "off" cycle. Programmer, 5 sec TFI, lockout on flame failure. Programmer, Selectable recycle/non-recycle function, TFI, and purge timing. Programmer, Selectable recycle/non-recycle function, TFI, and purge timing. Pilot stabilization, two stage capability. Programmer, Selectable recycle/non-recycle function, TFI, and purge timing. Pilot cutoff, pilot stabilization, check-run switch. Programmer, Selectable recycle/non-recycle function, TFI, and purge timing. Pilot cutoff, check-run switch. Programmer, Selectable TFI, and purge timing. Pilot cutoff, pilot stabilization, lockout on loss of air flow, non-recycle, check-run switch. UV amp, 2-4 sec FFRT. Use with UV1, UV2, 45UV3. UV amp, .8 sec FFRT. Use with UV1, UV2, 45UV3. Flame rect amp. 2-4 sec FFRT. Use with 69ND, 45CM. Flame rect amp. .8 sec FFRT. Use with 69ND, 45CM. Replaceable fuse for M-Series II programmer modules. Littlefuse 22508, 2 AG, 8 amp, 125 V.
Replaceable fuse for MP100E programmer module. Littlefuse 22903.5, 3.5 amp, 250 V.